While bank overdraft protections are offered to consumers as a service, they are not often the saving grace they appear to be. In many cases, overdraft protection and overdraft loans come with high fees that continue to increase the consumer’s financial woes. In some cases, consumers are not aware that the overdraft protection they sign up for comes with the high fees until it is too late and the fees have been taken out of their accounts. Without overdraft protection, most consumers who do not have enough money to cover a purchase or an ATM withdrawal simply have the transactions declined. If the transaction is not declined, for example because the consumer has signed up for overdraft protection, the bank can charge an overdraft fee to cover its cost of paying for the purchase on behalf of the consumer. Some banks offer a loan option where instead of overdraft fees, the bank charges interest on the amount it lends the consumer to cover the purchase. Overdraft fees can be charged when the consumer charges a purchase on his account, whether the charge is for twenty cents or five hundred dollars more than the consumer has in his bank account. Not every bank or financial institution charges overdraft fees, however, those that do charge an average of thirty five dollars per transaction. These charges can then accumulate and the next time the consumer receives a deposit in his account, the amounts covered in the overdraft and the fees charged are deducted from the deposit. 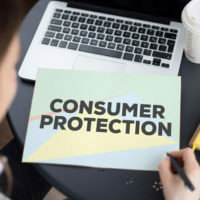 Consumers have to opt-in to overdraft protection, and are generally no longer automatically enrolled in the service because of the federal opt-in rule. Consumers who are improperly enrolled in this service may have a claim against the financial institution. However, some consumers are not aware they are signing up for overdraft protection and agreeing to the fees because they check boxes and sign the initial opt-in paperwork when signing up for new bank account. Other consumers opt-in for the overdraft protection because it is not explained in detail and the fee structures and consequences of overdraft protection are not clearly presented. Consumers can protect themselves from the cost of overdraft fees by being aware of the risk and watching their bank accounts to make sure they know how much money they have before making purchases. In addition, consumers can check with their banks to see if the bank offers a service whereby the overdraft protection is linked to a savings account. Under this service, any amount that is not covered by the funds in the checking account is taken out of the savings account. While this service may not be free, it may cost less than a thirty five dollar overdraft fee. If your bank or credit union charged you account fees that you did not know about or agree to, or you suspect you were a victim of predatory lending, contact an experienced Philadelphia predatory lending lawyer at the law firm of Louis S. Schwartz, Attorneys at Law.